Producer: Ross Hunter; screenplay: Peg Fenwick, from a story by Edna L. Lee and Harry Lee; photography: Russell Metty; editors: Frank Gross, Fred Baratta; sound: Leslie I. Carey, Joe Lapis; art director: Alexander Golitzen, Eric Orbom; music supervisor: Joseph Gershenson. Hudson, Rock, and Sara Davidson, Rock Hudson: His Story , London, 1986. Quirk, Lawrence J., Jane Wyman, the Actress and the Woman: An Illustrated Biography , New York, 1986. Variety (New York), 26 October 1955. Monthly Film Bulletin (London), October 1955. Willemen, Paul, "Distanciation and Douglas Sirk," in Screen (London), Summer 1971. Elsaesser, Thomas, "Tales of Sound and Fury: Observations on the Family Melodrama," in Monogram (London), no. 4, 1972. McCourt, J., "Douglas Sirk: Melo Maestro," in Film Comment (New York), November-December 1975. Fassbinder, Rainer Werner, "Fassbinder on Sirk," in Film Comment (New York), November-December 1975. Thousand Eyes Magazine (New York), January 1976. Creed, Barbara, "The Position of Women in Hollywood Melodramas," in Australian Journal of Screen Theory (Kensington, New South Wales), no. 3, 1977. Mulvey, Laura, "Notes on Sirk and Melodrama," in Movie (London), Winter, 1977–78. Kleinhans, Chuck, "Notes on Melodrama and the Family under Capitalism," in Film Reader (Evanston, Illinois), no. 3, 1978. McNiven, R. D., "The Middle-Class American Home of the Fifties," in Cinema Journal (Chicago), Summer 1983. Kuiper, E., "Douglas Sirk: Analyse op de montagetafel," in Skoop (Amsterdam), June-July 1985. Hunter, Ross, in American Film (Washington, D.C.), April 1988. Poppe, E., "Reflexions sur le role thematique: la veuve dans All That Heaven Allows , de D. Sirk," in Iris (Iowa City), no. 2, 1988. Klasen, B., "Het voordeel van de twijfel," in Versus (Am Nijmegen), 1, 1989. Babington, Bruce and Evans, P., "All That Heaven Allowed," in Movie , 34–35, Winter 1990. Metz, W.C., "Pomp(ous) Sirk-umstance: Intertextuality, Adaptation, and All That Heaven Allows ," in Journal of Film and Video (Atlanta), vol. 45, no. 4, Winter 1993. Reimer, Robert C., "Comparison of Douglas Sirk's All That Heaven Allows and R. W. Fassbinder's Ali: Fear Eats the Soul; or, How Hollywood's New England Dropouts Became Germany's Marginalized Other," in Literature/Film Quarterly (Salisbury), vol. 24, no. 3, 1996. With the politicizing of film criticism in the early 1970s, Douglas Sirk and his films took on a major importance. Already a distinguished theatre and film director before fleeing Nazi Germany for America, Sirk, who held leftist sympathies, had been influenced by Brechtian aesthetic theory. Of his Hollywood films, Sirk's 1950s melodramas were of particular interest: on the one hand, he was under an obligation to the studio to fulfil the viewer's expectations regarding the genre's dictates; on the other, Sirk, through formal strategies (lighting, decor, colour, etc., and the foregrounding of conventions) introduced disruptive and distancing elements into his films. As he readily acknowledged in interviews, his "excessive" presentation of the material was intended to make the ideological assumptions and values underpinning the films' concerns more fully apparent and, therefore, open to a critical scrutiny. Under contract to Universal-International throughout the 1950s, Sirk most often worked with the producer Ross Hunter who gravitated towards the "woman's film" in order to provide vehicles for more mature female stars. All That Heaven Allows was made in response to the highly popular Magnificent Obsession which teamed Jane Wyman and Rock Hudson who, because of the film, became a major star. In addition to All That Heaven Allows, There's Always Tomorrow , and Imitation of Life are particularly notable Hunter-produced Sirk films. There's Always Tomorrow , which is one of Sirk's finest works, has not received the amount of critical attention it deserves. 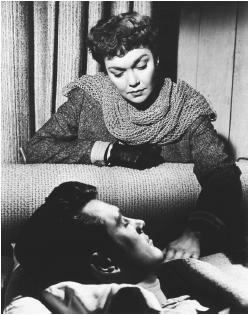 This may have occurred because the film is not Sirk at his most audacious— there is, for instance, nothing in the film that approaches the famous scene in All That Heaven Allows in which Wyman's children, after being instrumental in breaking up her relationship with Hudson, present her with a television on Christmas Eve so that she can "experience" life at her finger tips. This extraordinary sequence ends with a shot of Wyman's reflection on the television's blank screen. Sirk faced a major constraint with the All That Heaven Allows project in that the film had to have a happy ending in which Wyman and Hudson are reunited as they were at the conclusion of their previous film. Conceivably, the demand contributes to the awkwardness of the film's resolution. On the other hand, the film's subject matter gave Sirk a particularly strong opportunity to mount a scathing critique, which is astonishingly direct, of middle-class American society in which class and gender oppression are the structuring principles. Wyman, a 40-ish widow of prominent social position living in a small New England town, is rejected by her peers when she becomes romantically involved with Hudson who, in addition to being considerably younger, practises gardening, i.e., labouring, to help finance his plan to own a nursery. Preceding Wyman's relationship with Hudson, the film indicates what is expected of her: the devoting of her remaining years to her husband's memory and the taking care of their children who are already young adults; alternatively, if she should remarry, it would be solely for the purpose of companionship. Yet, in the first country club sequence, Wyman experiences an attempted physical seduction and is offered a clandestine affair; and, in the second sequence, in which she tries formally to introduce Hudson into her social circle, she is subjected to verbal derision. (In the latter sequence, the occasion being celebrated is a middle-aged man's engagement to a much younger woman.) Sirk uses both of these sequences to present the bourgeoisie as hypocritical, emotionally bankrupt, and vicious when it comes to maintaining their social elitism. In addition to the external pressures, Wyman is also rebuked by her children who are totally committed to their middle-class identities and fear, as she does, social ostracism. Although Sirk takes full advantage of these aspects of the material, he has difficulty in providing an alternative to the dominant ideology, given the genre's dictates and Hollywood's ideological imperatives. Hudson, who is associated with nature, self-definition, and the rejection of social status, offers Wyman a retreat, visually represented by the abandoned mill which he converts into their "new" home, into a mythic vision of what America represents. Interestingly, Hudson's position prefigures the counter-culture movements of the 1960s but, like those, it doesn't have a coherent political platform and, as such, is an inadequate solution. Most likely Sirk was obliged to find an alternative within American culture which accounts for the Thoreau references; presumably, to signal the failure of such an endeavour, Sirk repeatedly defines the Wyman/Hudson relationship in relation to the fragile: for example, Wyman accidentally smashes the Wedg-wood tea pot which Hudson has reconstructed but, more tellingly, the film concludes with Hudson being incapacitated. In the film's ambiguous final shot, the fawn, which has been previously associated with Hudson, is seen through a window which separates the couple from nature. (The Christmas Eve sequence is introduced with a shot of Wyman peering out from a window watching carol singers and children. Again, the image suggests confinement and isolation.) As a result, although Sirk clearly intends the film's happy-ending convention to be less than satisfying, the specific reason for his undercutting of the film's resolution remains inarticulated. Wyman's screen persona is well used. Thoughout the film's initial sequences, she conveys both the character's passive identity and her unformulated resistance (given expression through the red dress she wears to the country club) to the life she is supposed to be content with. And, with this film, Hudson fully established his screen persona— while exerting a masculine image of inner strength, he also convincingly suggests, in the intimate sequences with Wyman in the abandoned mill, a strong emotional vulnerability which challenges traditional gender-role expectations. Although the formal aspects of Sirk's work led to the initial critical attention, his films, as melodramas, have been equally of interest to the concerns of feminist film criticism. As an analysis of a middle-class woman's oppression, All That Heaven Allows is an extremely powerful statement. Can you help me, is "All That Heaven Allows" the movie where Jane Wyman and Rock Hudson are standing together or hugging at the end with the snow falling? I have been trying to find this movie where it ends like that. Thanks for your help.